They actually had to come from behind to pull it off, the visitors drawing first blood when the on-fire Callum McCowatt struck his 12th goal of the season – taking joint lead in the golden boot race in the process – just before the half hour. That only seemed to spark Wellington into life though and they soon equalised with a turn-and-shot from close range by Ross Allen. “We were disappointed with aspects of the first half obviously, particularly conceding the goals we did,” coach Danny Hay admitted. “It was a big result and a big performance,” he said. While Figueira will be delighted to have inched further towards a top-two finish, he has no hope of catching Auckland City, who proved too good for the Wellington Phoenix Reserves. 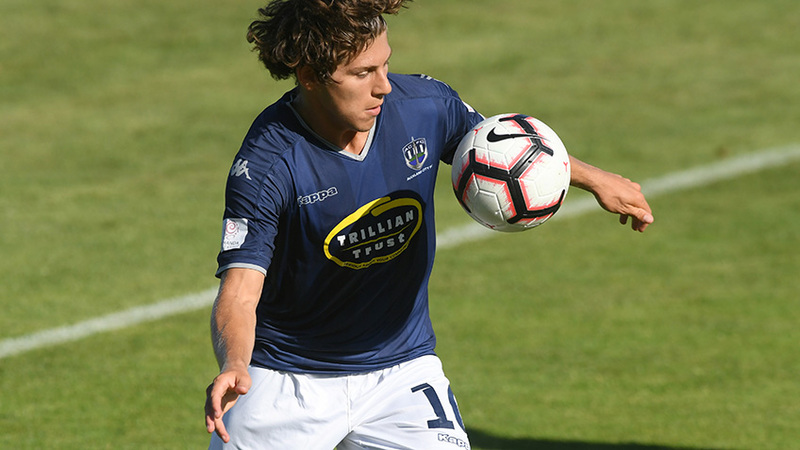 Youthful talent won the day for the Navy Blues with David Browne and Yousif Ali finding the net while a familiar name replied for the Phoenix, former Team Wellington skipper Justin Gulley making a swift goal-scoring return to the ISPS Handa Premiership after recently signing for the country’s only professional club. The Cantabrians, who could still finish second themselves, now need only to be wary of the threat of fellow South Islanders Southern United, who still have an outside chance of wrestling away their play-off berth and face a visit by title-chasing Auckland City FC on Wednesday evening. AC: 1. Enaut ZUBIKARAI (GK), 5. Angel BERLANGA (c), 6. Brian KALTAK, 7. Cam HOWIESON, 10. Micah LEA'ALAFA, 11. Fabrizio TAVANO, 12. Dylan MANICKUM (21. Maro BONSU-MARO 61'), 14. Jordan VALE, 15. Dan MORGAN (8. Albert RIERA 86'), 16. Yousif ALI, 19. David BROWNE (Alfie ROGERS 81'). SUBS NOT USED: 18. Ruben PARKER (GK), 20. Te Atawhai HUDSON-WIHONGI.